Governor Culver visiting the Iowa National Guard 294th Area Support Medical Company in Iraq. Governor Chet Culver is defending his recent, two-day trip to Iraq. Jonathan Narcisse, a Democrat who announced this weekend that he’s challenging Culver’s reelection, called the trip nothing more than a “photo op” for Culver. Culver says this weekend’s trip was “absolutely” justified. “I am the commander-in-chief of the Iowa National Guard and have a duty and an obligation to support our troops,” Culver says. Culver held a telephone news conference with Iowa reporters on Friday once he got to Iraq. 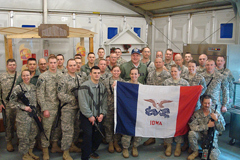 Culver visited three cities in Iraq, including Baghdad, meeting with Iowa soldiers serving in Iraq. “It was an honor and privilege to be there with them,” Culver said Tuesday, “and hopefully I’ll have another opportunity to see more troops in theater.” That might mean a trip to Afghanistan where 3,500 Iowa National Guard soldiers are headed later this year.